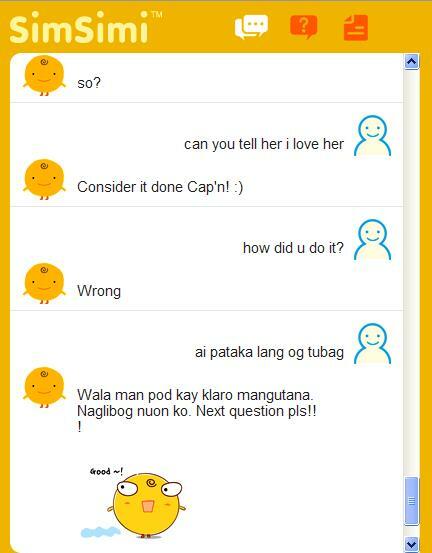 First Time Talking to SimSimi | iStoryang HaaayTek! SimSimi is a super chatbot; a super conversationalist; an artificial conversation program; a super computer chat robot– that uses artificial intelligence in engaging a conversation with human users. It was created in 2002 by a Korean tech company–ISMaker. It has more than 11 million question-and-answer conversations that are piled up in its massive storage. Once a line or question is sent to the SimSimi app, it will scan its database for the most possible and oftentimes hilarious replies. However, SimSimi has been banned in Thailand after some of its replies contain profanity and some criticisms against leading Thai politicians. Children in some places are warned of the replies from SimSimi as it is damaging to children. Simsimi replies in seconds based on the knowledge it got from its 2.7 million users that became part of its database. You can also add some texts to SimSimi if you want the app to answer appropriately similar questions in the future.The screenshot above is my first conversation with SimSimi. Take note it can understand and replies in several languages including our very own Cebuano. Simsimi is now on multi-plaftorm allowing users to use it over iPhone and Android phones since 2010 and most of the time in your computers. SimSimi is compared to Siri on iPhones but the latter can set up appointments when asked to do it by its owners. SimSimi is not recognizing that for now. However, it’s enjoyable and fun talking to SimSimi. .hai simsimi ! How are u today ? .i misS my familY ,cAn U telL my sis gwen and brother wen n cebu to go hoMe? Simsimi , ,do u lyk river? We have an river nameD ,ambAkana ,nicE yun ! Xa xunday ,join us ,maliligo kame ,cge na. Haha ! I like you ! VerRy much ! .ow’s ? CAn u plx help me avouT my luVlyf ? ElLuw simsimi ! Hows ur day ? hi!!! can you answer my question?? ?